Lake Placid, NY – The Olympic village of Lake Placid, nestled in the Adirondack Mountains of Upstate New York, holds a special charm. The site of the 1932 and 1980 Olympics, it’s a town where the legacy of the Games lives on – a place where memories have been made for athletes over decades. 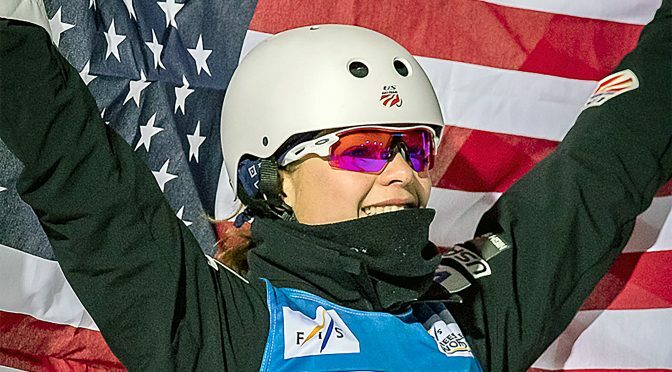 Freestyle aerials skier Ashley Caldwell, now 23, found a rush or memories flooding her mind this month as she drove into Lake Placid for the first time in two years. A Virginia native, this was her home for five years as a young teen chasing a dream. But amidst the nostalgia was the omnipresent thought of being up on the top of the jump a few days later with thousands down below watching. Ashley was like any other 12-year- old girl in 2006, active in gymnastics and just enjoying her childhood in Virginia. Her life changed on Feb. 23 when she watched on NBC as American skier Jeret “Speedy” Peterson threw his legendary Hurricane – a quintuple twisting triple flip – at the Torino Olympics. Now, fair to say, most moms wouldn’t recommend their daughters huck flips 65 feet in the air. But that’s what Ashley does. And she does it quite well, thank you. A two-time Olympian, she’s the reigning World Cup champion and one of the only female athlete presently doing triple flips. “When I first saw the sport when I was young, what I saw was a group of athletes that were a bit wild and thrill seekers,” said Caldwell. “But they were also full of hard work and dedication. With an inspired 12-year- old, the Caldwell family sought out aerials guru Nick Preston at Waterville Valley. Eventually, the young teen moved into a new U.S. Ski and Snowboard Association residence program at Lake Placid under the eye of gymnastics and aerials coach Dmitry Kavunov. In two years she was knocking down NorAm podiums. And in 2010 she was the youngest Olympian in Vancouver at 16. 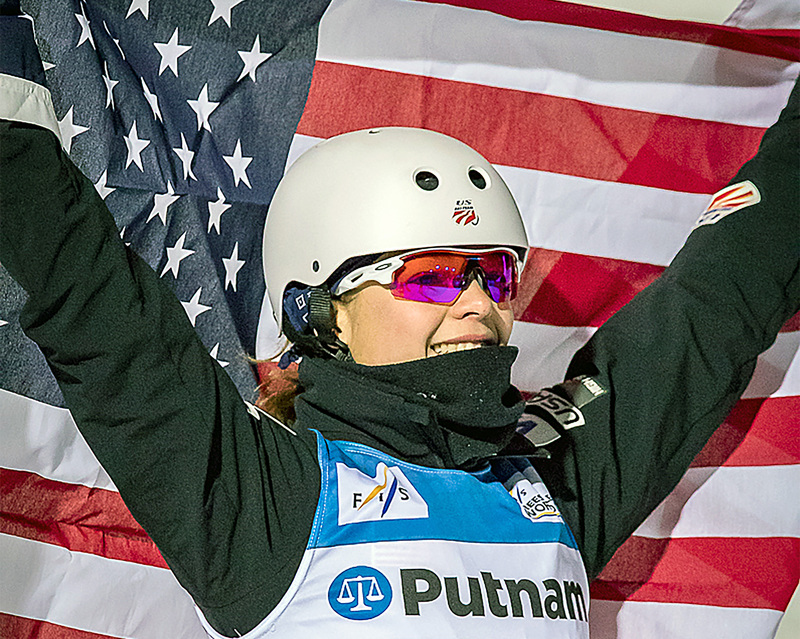 A year later, at just 17, she won in Lake Placid. She brought tears to a lot of eyes. But as an athlete seeking to be best in the world, moving up to triple flips was painful – mentally and physically. She took a few big hits along the way. But she stuck with it. It was a Saturday night in Lake Placid. A huge crowd gathered at the Intervale Jumping Complex. Caldwell had thrown a triple flip with a layout and two twists on her first jump to take the lead – nice and clean. Now it was down to the finals, with scores zeroed out and everyone equal. It had been a tough week in Lake Placid. Weather hampered her triples training. But on competition day, she hit a triple twisting triple flip in training that was just so sweet – “best full-full-full I’ve ever done.” With every jump Saturday evening, her smile grew bigger. At the top of the jump you could see the confidence in her eyes. Coach Matt Saunders gave her the go. She pointed her ID One skis down to the triple kicker and launched high into the midnight black sky – three flips with three twists, something only freestyle aerialists can experience. Those four seconds in the air felt like a lifetime – a revolving blend of darkness and light as her body catapulted smoothly around and around. Then, bam, she stuck the landing and pumped her fist as a deafening roar broke the silence of the crowd. Suddenly, it was like that day five years earlier when she won her first World Cup on the same venue. She grabbed an American flag and held it proudly behind her. The roller coaster of pain she had endured for a decade learning how to become the very best in her sport was cast aside.